This book is perfect for the young and not so young who want learning Python to be fun. Turtle Graphics is a great way to start with Python. Within minutes, you can be typing Python commands and instantly see the effect of those commands on one or more "turtles" that move around the screen, interact with each other and draw colored shapes and patterns. 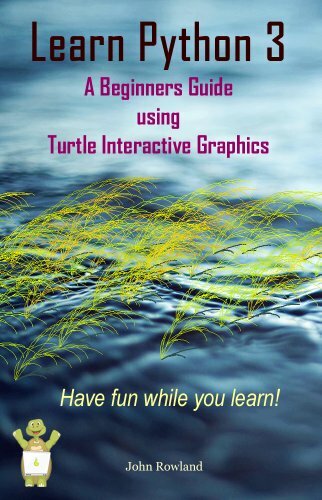 Turtle Graphics is an integral part of the Python language, and the book uses it to explain how to code dialogue with the user, lists and dictionaries, loops, writing and calling functions, reading and writing to external files, game creation, and even draw those dramatic examples of computer art, fractals. Learning Python through Turtle Graphics is particularly suitable for kids and those who help or teach them because learning to program happens almost without the reader realising it! The book includes numerous graded exercises. Sample answers are provided in the book and on the companion website at www.learnpythonquickly.com. An important feature of the book's design is the extensive use of hyperlinks. Most of these link to the book's comprehensive glossary. This is no mere two-page 'Jargon Buster'. It is a reference document in its own right containing detailed entries providing the syntax of commands, code examples and further explanations of topics introduced in the chapters.